This is one film I would love to see again,owning it on VHS cassette in the early 90's. 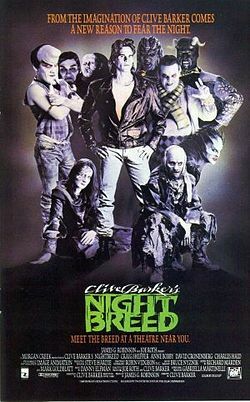 Never seeing it released on DVD in the UK , I would love to see it again.Directed and written by Clive Barker,and this is easiest his finest work to date. Starring an almost unknown Cast,with a famous Director starring as probably the most sinister serial killer ever seen on screen,that is David Cronenberg,as Dr Decker,who convinces one of his unhinged, mentally ill patients that he is actually a serial killing psychopath. Who is eventually killed by the Police. 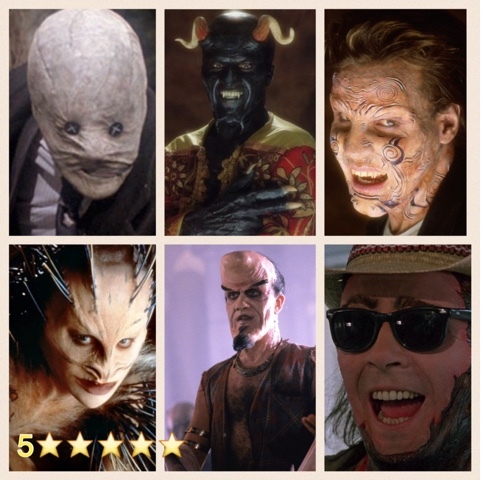 Being reborn as Cabal,and being accepted into the world of Median an underground world,full of Monsters,called the Nightbreed,but unlike the real world,these Monsters are not as vicious or nasty,as their Human Counterparts are. Who have been happily living underground,and only if seen,classed as being mythical creatures. I loved this film,yet being Directed by a British Author and Filmaker,we have never had the privilege of owning this great film in the UK,wether it is to ownership rights, I'm not sure, but I have never seen a DVD or bluray of this great film. With reports of a Two and a half hour Directors Cut of this film being called the Cabal Cut, released in 2014 and yet we can not see it in the UK. I know this film was plagued by reshoots,rewrites,and a Two hour plus film wanting to be cut down to a Ninety minute film,with most of the gore and violence taken out to make a Restricted R rating in the US. And wrongly marketed as a Slasher Flick,rather than the Mystical Monster flick it really is. I really want this film to released again,and given the treatment it deserves, I'm hoping a company like Arrow Films,Or even Anchor Bay picks this up,and gives it a proper release edition. A film that was so different to Clive Barkers other works,such as Lord Of Illusion, and the Hellraiser Films,this was always my favourite film,from this great Author and Filmmaker, I would love to see it again,as it has been twenty plus years,being one of the last great horror films made in the nineties,which was to become the decade of Thrilllers and Action Flicks.